Definition Deficit Disorder (“DDD”), also known as the “me no speaka the English distraction” and “definition derby” is a form of sophistry by obfuscation that demands that one’s opponent fulfil unreasonable or even impossible definitional criteria, not to advance the debate but to avoid the debate by claiming one’s opponent cannot adequately define their terms. ID advocate: Intelligent design theory asserts chance causes cannot account for the generation of novel macroevolutionary features and that the best explanation for complex, functionally specified information beyond a reasonable chance threshold is the “artifact of an intelligent agent. ID opponent: What do you mean by the terms “intelligent,” “design,” “chance,” “complex,” “functional,” “specified” and “information.” These terms are so vague as to render your argument meaningless. ID opponent. Since humans are not inherently superior to other organisms there is little point to this subject. ID supporter: I suppose next you’ll assert that it is a scientific fact . . . that humans are not inherently superior to other organisms. ID opponent: That depends on how you define superior. . . .If you can’t adequately define a term that is central to your argument, then maybe you should reevaluate your argument. Notice that it was the ID opponent who inserted the term “superior” into the debate. When the ID supporter challenged him, the ID opponent immediately resorted to DDD by claiming the term he had just used has no clear definition. A Princeton prof attempts to explain consciousness. Hush, we may be hearing answers now. That’s what one gets for arguing and debating with people who seem to have an uncanny ability to slide in and out of various parallel universes at the snap of a finger where rules change like appearing and disappearing mist on a fogging morning. Just when you think you’ve got them backed into a corner, they instantly slide into another universe where once again the rules play out differently. It’s like a form of Matrix Remix debate strategy where who reality is imprisoned in a permanent Fog, which is what they want the world to become. Seriously, just look at the world around us globally. Of course they follow the lead of their Father who from the beginning used definition shell games regarding what is really meant by “Good” & “Bad” (Genesis 3). Evolutionists have only made it more colorful & embellished on details a bit more ever since that first incident. When I read this OP I started to draw up a mental list of ambiguous terms commonly used in the ID debate. I shouldn’t have bothered. You have an excellent list right there. Every single one of those terms is open to interpretation. Take “information” for example – it has been the subject of hundreds of books and is measured in many incompatible ways. Do you seriously think a request to clarify exactly what is meant by each one is some kind of evasion? It may be tedious, but what harm can it do to be more explicit about what you mean? In the atheistic/materialistic worldview how can any word in any language have any true meaning in the first place? Excerpt: If atheistic evolution by NS were true, we’d be in a beginningless series of interpretations, without any knowledge. Yet, we do know many things. So, naturalism & atheistic evolution by NS are false — non-physical essences exist. But, what’s their best explanation? Being non-physical, it can’t be evolution by NS. Plus, we use our experiences, form concepts and beliefs, and even modify or reject them. Yet, if we’re just physical beings, how could we interact with and use these non-physical things? Perhaps we have non-physical souls too. In all, it seems likely the best explanation for these non-physical things is that there exists a Creator after all. Does any one, besides atheists/materialists, really believe that a computer truly understands the meaning of any of the words it processes?? [IBM’s “Jeopardy!”-winning supercomputer] Watson is basically a text search algorithm connected to a database just like Google search. It doesn’t understand what it’s reading. In fact, “read” is the wrong word. It’s not reading anything because it’s not comprehending anything. Watson is finding text without having a clue as to what the text means. In that sense, there’s no intelligence there. It’s clever, it’s impressive, but it’s absolutely vacuous. Excerpt: The Turing test isn’t a test of a computer. 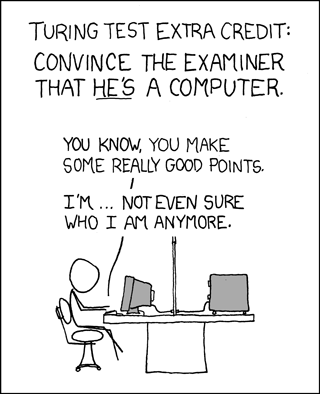 Computers can’t take tests, because computers can’t think. The Turing test is a test of us. If a computer “passes” it, we fail it. We fail because of our hubris, a delusion that seems to be something original in us. The Turing test is a test of whether human beings have succumbed to the astonishingly naive hubris that we can create souls.,,, It’s such irony that the first personal computer was an Apple. Moreover, for codes to exist, Intelligence must first exist so as to assign ‘meaning’. i.e. ‘Meaning’ must exist before a code can be brought into existence. “A code system is always the result of a mental process (it requires an intelligent origin or inventor). It should be emphasized that matter as such is unable to generate any code. All experiences indicate that a thinking being voluntarily exercising his own free will, cognition, and creativity, is required. ,,,there is no known law of nature and no known sequence of events which can cause information to originate by itself in matter. Excerpt: (Computer) Simulations such as Dawkins’s WEASEL, Adami’s AVIDA, Ray’s Tierra, and Schneider’s ev appear to support Darwinian evolution, but only for lack of clear accounting practices that track the information smuggled into them.,,, Information does not magically materialize. It can be created by intelligence or it can be shunted around by natural forces. But natural forces, and Darwinian processes in particular, do not create information. Active information enables us to see why this is the case. The basic problem concerning the relation between AIT (Algorithmic Information Theory) and free will can be stated succinctly: Since the theorems of mathematics cannot contain more information than is contained in the axioms used to derive those theorems, it follows that no formal operation in mathematics (and equivalently, no operation performed by a computer) can create new information. Ordinarily this exchange of conveyance and discernment is assisted by common use and/or context, which we all rely upon. However, during the course of a conversation, particularly concerning technical and/or contested topics, it is a common experience to intend word meanings in a commonplace or contextually ordinary way, but then discern that one’s conversational partner intends something different by his/her use of the word in question, or has been deploying a word in a way that it makes it difficult to discern which of several possible meanings are intended. You’ve said nothing: ‘mean’ = ‘intend’. There is no disparity. intelligibility implies intent. It is implicit in intelligent design. I mean ‘intent’ is implicit in ‘intelligent design’ – in case it’s unclear. Great RB is back with more raw spewage. The problem with all this is that the successful communication of meaning depends upon more than the deployment of dictionary definitions. And that is figured out by the dictionary definitions along with the context. Ordinarily this exchange of conveyance and discernment is assisted by common use and/or context, which we all rely upon. When I read this OP I started to draw up a mental list of ambiguous terms commonly used in the ID debate. LoL! ID’s terms are only “ambiguous” to the willfully ignorant. And here you are. Every single one of those terms is open to interpretation. Only if you struggle with the English language. Take “information” for example – it has been the subject of hundreds of books and is measured in many incompatible ways. Reference please. Do you really think we are just going to take your word for that? Do you seriously think a request to clarify exactly what is meant by each one is some kind of evasion? Seeing that evos never clarify anything it is strange that you ask us for clarification of terms that we have fully clarified. It’s so nice that Reciprocating Bill, a veritable master of definition derby, stopped by to instruct us on the finer points of exactly what is entailed by ”cooperative conversation”. There is a list of physical entailments of recorded information that can therefore be generalized and compiled without regard to the source of the information. In other words, the list is only about the physical entailments of the information, not its source. I am using the word “entailment” in the standard sense – “to impose as a necessary result” (Merriam-Webster). These physical entailments are a necessary result of the existence of recorded information transfer. …you neither understand the word entailment, nor understand the entailment relationship described in the simple illustrations we have provided. For that reason, you repeatedly travel the wrong way down a one-way street. I assert (not suggest) that you do not understand entailment, and due to your failure to grasp entailment you have constructed an argument beset with a fatal logical flaw. Bill, if a specific thing only exist under specific conditions, then does its existence entail the existence of those specific conditions? To any rational person not steeped in denial, intelligent design is a scientific fact. We know it exists because we use it every day, and we know it is fundamentally different from chance and natural law. In many cases we can recognize it easily and expect to be able to do so even if the designer(s) in question isn’t(aren’t) human. Requiring that the terminology be defined in some supposedly technical, scientific fashion is just a diversion so that the core principle and concept can be ignored. Of course ID exists; of course the recognizable distinction is the quality of functionally specified complex information (or some other string of terms that means approximately the same thing). Every post here, even when arguing against it, is a demonstration of it and an expectation that others will recognize them as such and employ ID to respond. Since these obvious core concepts cause problems for the atheist/materialiist worldview, they are left denying the obvious – or at least employing definition diversions to keep from having to cast their eyes upon what is right in front of them. What makes this plain is the pass they give to their own terms and, as Mr. Arrington points out, their habit of inserting and using similar undefined terms. Also, when they are provided definitions, they either ignore them, refuse to accept them or demand some “kind” of definition they can’t provide for their own terms – I believe one poster here required a “canonical” definition. Barry, when you have to completely misrepresent the words that have been written by commenters to support your claim that DDD is used by evolutionists to obfuscate the issue being discussed, the validity of your claim must be hanging by a thread. Since the OP being commented on included the word superior in its title, I was hardly the person who inserted it into the debate. And I went into additional detail to support my point. You conveniently ignore these little points. I won’t go as far as to call you a liar, although the definition fits. I am willing to admit the remote possibility that your misrepresentation of an easily confirmed fact was an innocent error. They occur to the best of us. RB’s rational approach makes far more sense that simply putting your fingers in your ears and yelling DDD, DDD, DDD. Since the example of superior has already been brought up, I will stick with it to demonstrate that its definition can change depending on its use and who uses. If I say that the Beatles are superior to the Stones, you will probably agree of disagree. But you probably won’t ask me to define what I mean by superior (although you could). But if someone says that humans are superior to chimps, the definition of superior will be significantlh different for a theist than for a non-theist. So, in this case, a clear and agreed to definition is necessary if you are going to have any meaningful debate. And by agreed to definition, I am not saying that both parties have to agree that the definition is correct, just that they both agree to limit the debate on the grounds of that definition. Otherwise they will not even be debating the same thing. Amazing- the definition of the word being used depends on the context it is being used. Really? Are you just now realizing that? Words can have several definitions and yes it usually depends on the context as to which definition is being applied. That is what education is for, to help you make the proper definition determinations when involved in a conversation. If I say that the Beatles are superior to the Stones, you will probably agree of disagree. But you probably won’t ask me to define what I mean by superior (although you could). I know what “superior” means but you haven’t said in what context they are superior. Obviously the Stones are superior when it comes to the number of recordings they have released. They are also superior when it comes to the number of tour dates and longevity. The Beatles were more superior in their versatility, creativity, harmonies, and fan admiration. Joe, it is nice to see that you agree that it is a perfectly acceptable for someone to clarify a definition and that DDD is just Barry’s attempt to derail any contentious discussion. I appreciate the support. Since the OP being commented on included the word superior in its title, I was hardly the person who inserted it into the debate. You were however the person who introduced obfuscation over the meaning of “superior”. And I went into additional detail to support my point. You conveniently ignore these little points. Yes, you did go into additional detail to support your point, which is that “humans are not inherently superior to other organisms”. (Again, that’s what intellectual honesty looks like). But your additional detail did not clarify the definition of “superior”, rather you listed what you believe to be examples of animal remarkability, not superiority. For your argument to be intellectually honest (albeit lame) requires that you had written “That depends on how you define superior remarkable” and then go on to substantiate the scientific facts on how humans are ‘inherently’ unremarkable compared to other organisms. But you didn’t do any of that, did you. No. “Remarkable” is not a synonym for “superior” nor an antonym implying “inferior”. Your choice of “remarkable” is a rather unremarkable ambiguity to blot out the goal posts altogether. Non-sequiturs and straw-men define neither superiority nor inferiority nor even remarkability, and none of it was scientifically factual, it wasn’t anecdotal, it was so bad it wasn’t even wrong. You deflected the challenge to substantiate with scientific facts your assertion ‘that humans are not inherently superior’, with a non-sequitur of straw-men about “remarkability”. That is what intellectual dishonesty looks like. And none of your points were ignored. They have been eviscerated, filleted and laid before you ad infinitum. Bill, I used a specific word in making a claim. I used the word, then gave the dictionary definition of that word, then restated my claim using the dictionary definition in place of the word itself. You subsequently argued for two months that my use of the word was incoherent, only to eventually concede that it was not. There is nothing to revise. Yes, you are basically correct in the order you describe. But the examples I detailed were not examples of things being remarkable, they were examples of attributes that are superior in one animal over another. But if someone is going to claim that humans are superior to all other animals, I think that it is incumbent on the person making this claim to definite what they mean by this. Is that really an unreasonable expectation? But the examples I detailed were not examples of things being remarkable, they were examples of attributes that are superior in one animal over another. Again you imply you already had a definition of “superior”, a definition you implied in your examples. But they were not examples of “attributes” (superior or otherwise). “stereoscopic vision” or “opposible thumbs” are attributes, arguably superior attributes. “Need”, “exploitation”, “survival” are not. To be most charitable, you listed inter-dependencies or inter-actions. But regardless, they remain straw-men because no one argued humans (or any animal) is independent or does not interact with (or exploit or need) other species. Your examples did not demonstrate “superiority” or “inferiority” or even “remarkability”, save possibly the human brain (and mind). As well as being straw-men, your examples were largely orthogonal and so ambiguous as to preclude analysis other than to begin by asking you to be more detailed, specific and on subject. That is what I mean when I said it was so bad it wasn’t even wrong. Where to begin? But if someone is going to claim that humans are superior to all other animals, I think that it is incumbent on the person making this claim to definite what they mean by this. Is that really an unreasonable expectation? And so, was it unreasonable for Mung to expect that since you had claimed “that humans are not inherently superior to other organisms.” that it was incumbent on you to define what you meant? And did you, do you, seriously think that a non-sequitur of straw-men about remarkability (orthogonal, not actually superior) non-“attributes” would suffice as a “definition” of not superior, or inferior, or not remarkable, or wherever it was that you planted your goal posts? Actually, you pivoted from using “entailment” in a sense that yields reasoning beset by a fatal logical flaw to a sense that is useless because it assumes its conclusions. Now you said your thing and I said my thing. Give it a rest. That’s my plan. I know that you are being sarcastic but you have been the only one here willing to provide a meaning for your use of this word. The rest would rather complain that I should not even be asking for one and fabricating a pompous new reason to justify not having to answer it (I.e., DDD). Is everyone else too afraid to define what they mean when they say that humans are superior to all other animals? Are you referring to physical properties, intellectual properties, spiritual properties, sexual prowess, all of the above? I defined my usage of the term at the time that I used it. Joe, it is nice to see that you agree that it is a perfectly acceptable for someone to clarify a definition and that DDD is just Barry’s attempt to derail any contentious discussion. I said that you have to clarify the context, not the definition. Has anyone picked up on the irony of a laywer spurning the careful use of definitions ? Anyone ever read a legal contract lately ? Don’t even start on the topic of plain English vs legalese. Is everyone else too afraid to define what they mean when they say that humans are superior to all other animals? It has to do with goal, purpose and meaning. Brilliant title for this. It really is a form of ADD. As mentioned, a ‘distraction’. Once the topic gets bogged down in re-definining definitions it can go on forever without a conclusion, thus attention-deficit. I’ve done the same thing many times when trapped. I see it more of a universal human problem and not limited to anti-ID (although maybe more common there). We suddenly want “clarification” when we lost the argument. Thus we have legalese and hair-splitting. It depends on what the defintion of “is” is, etc. It’s one of many methods to squirm out of a bad spot in an argument. Distraction works well. It often starts with a memory-bluff: “Yes, but in that other thread you claimed …” Now you have to find that old post. You might give up there: “No, I never said that” … or else waste a day trying to find it. Then quote the old post “But that’s out of context, what I was really talking about was …” Now you have to re-post the context. Then another opponent joins. “No, you’re misrepresenting what he said”. Give that a few days, and ADD has finally won. Nobody cares any more and you live to argue the same thing again another day.